Nothing like tea and toasted tea-cakes at The Apothecary. A rambling tea shop in Rye. Leather armchairs, newspapers and a congenial atmosphere. You have to walk in the wild wind for a few hours to deserve this and to enjoy the atmosphere to the full! 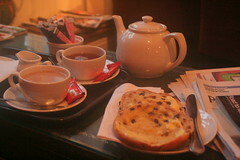 We had a pot of tea and toasted tea cakes. The tea was served in a large pot so there were plenty of extra cups whilst I read the Saturday papers. This could rate as my favourite tea shop. A walk from Rye Harbour. A great winter’s walk. Drive down to the Harbour from Rye. Park in the car park to the right as you reach the end of the road. Come out the car park and go straight on through the gate and follow a track out to the beach. The track goes parallel to the River Rother to the left and the marshes stretch out to the right. So there are plenty of birding opportunitities on both sides. Along this path we saw some kingfishers. The RSPB hut is on the track and there is all sorts of useful information to glean from the board. I was really hoping to see the Marsh Harrier and the guide said that he had seen one yestereday so I was very keen and kept my eyes pealed. 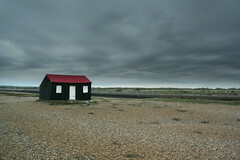 Keep going past a strange desolate red hut that makes a good subject for a photograph. On to the beach and then turn right following along with the marshes on the right and the beach to your left. Every so often it is worth braving the wind and go over the top to see the shoreline. We tracked a friendly flock of oyster catchers with their long red beaks. Continue up the beach to the first set of groynes and then you know its time to head back into the marsh by a small track. This leads to an excellent hide that over looks a pool. This track continues back towards the car park but there are some excellent views over the marshes. Skirt to the right of the caravan park on the way back to the carpark. Now you have earned a well deserved pot of tea and toasted teacakes back the Apothecary coffee shop in Rye town. Enjoy.